But I did realize that this blog post was going to be my 1ooth! I guess we can stop reading/writing work emails for a second to celebrate that! How about a picture of Little E and I in one of the most recognizable places in Nebraska??? Little E and I would like to say thank you to my loyal readers! Winner, Winner! Front Line Winner! It only took about 10 casts, and I managed to land a great little rainbow! So the trip was a success right off the start! Even though he was a “put and take” stocker trout, I don’t eat them; so I released him to fight another day. After a couple hours, I decided to call the day a success and head for home. 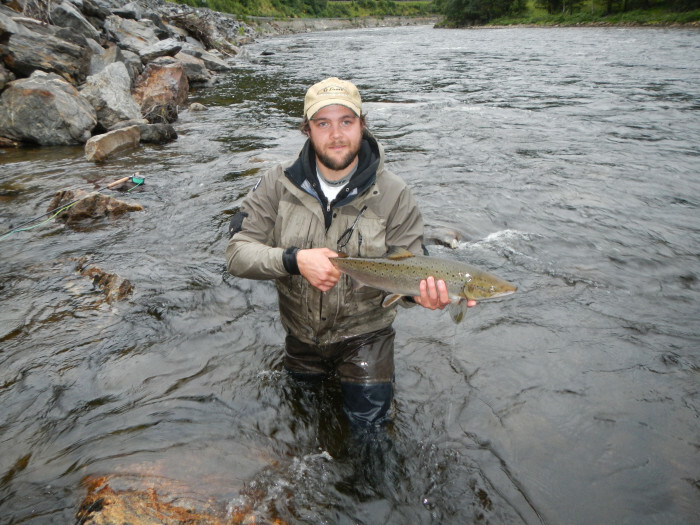 One of my favorites is the blogger behind Trout Passion; a blog about fly fishing in Sweden. I have to admit, that I am pretty jealous of the pictures that he posts on this blog. Fishing in Sweden seems way cooler then Nebraska… at least he seems to put up pictures of way bigger fish then I do! Any place that has an abundance of trout, pike, and salmon must be a pretty cool place to live and fly fish. I have never been to Europe; but I ever make it, I know where I want to go fishing. Don’t get me wrong; I love Nebraska, and I love fishing here… but I think he’s got us beat on the fishing front. Check out Trout Passion and follow his blog too. He puts up some great flies, great pictures, and has some great tales from the “other side of the pond”! He is even having a contest right now where you can win some gear… Swedish Fishing gear, that is pretty sweet! Back to the work grind… no time for a proper post. So tonight I’ll leave you with an older photo from a fly fishing outing. See you after crunch time! In addition to fishing, I do occasionally hunt. I’m not as big into hunting as I am into fishing, but I do enjoy deer hunting every fall. Actually, deer hunting was the first outdoor activity I really latched onto. When I was 13, I shot my first buck, a 4 x 4 whitetail. It even landed me in the local paper… I should put that picture up sometime. Every fall I go back to what I consider my favorite my favorite spot on earth. A small clearing of land inside a wooded creek on some of my grandfather’s/uncle’s land. I have taken almost every deer I have ever harvested from this spot. And my rickety old tree stand… that has been there as long as I have been. Every year I have to go back and re-nail it to it’s tree. To tell you the truth, the stand is a little dangerous. My oldest brother fell out of it once several years ago, and refuses to use it again. Not much to report from today… I took Little E to the lake for a while this afternoon in pursuit of some more trout. All we caught was one little bluegill… At least we didn’t get skunked! So far it appears to working fine… We’ll see when I get out to the water again. And now back to my work!